To Cite: Farhadi M, Bakhshandeh M, Shafiei B, Mahmoudzadeh A, Hosseinimehr S J. The Radioprotective Effects of Nano-Curcumin Against Genotoxicity Induced by Iodine-131 in Patients with Differentiated Thyroid Carcinoma (DTC) by Micronucleus Assay, Int J Cancer Manag. 2018 ; 11(6):e14193. doi: 10.5812/ijcm.14193. Background: Iodine-131 therapy is one of the main strategies in the treatment of thyroid diseases such as hyperthyroidism and thyroid cancer. Iodine-131 emits high-energy beta particles and gamma rays. Although this technique is considered safe, there are many in vivo and in vitro studies reporting genotoxic damage induced by I-131. Induction of oxidative stress is one of the main mechanisms of therapeutic plan with I-131 and also mentioned as a side effect of it. Objectives: The aim of this study was to determine the effect of Nano-curcumin on chromosomal damages in peripheral blood lymphocyte by micronuclei (MN) assay in patients with differentiated thyroid carcinoma (DTC) after therapeutic dose of I-131 as a clinical trial. Methods: Twenty-one patients with DTC treated with I-131, activity (5.5 GBq) for destructing remnant thyroid functional tissue, were randomly selected to receive curcumin (nano-form, 160 mg/day for 10 days; n = 11) or placebo (n = 10) in a double-blind manner. We obtained blood samples from each patient before treatment and one week after radioiodine therapy. We calculated the number of MN in blood samples. The present study is the first clinical trial for investigating curcumin effectiveness to reduce genotoxicity effects by radiation after radioiodine therapy. Results: The frequency of MN in lymphocyte was significantly increased at one week after I-131 treatment in placebo and curcumin groups. 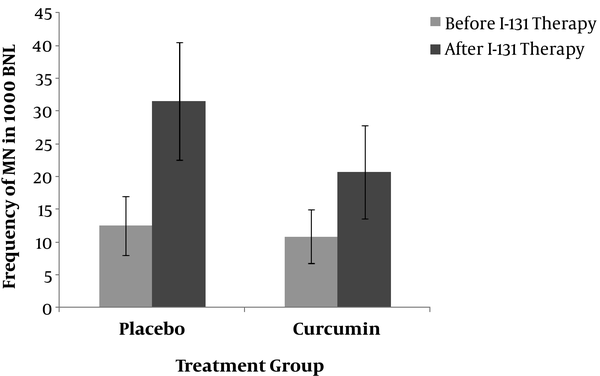 The frequency of MN in the curcumin group was significantly lower than placebo group after I-131 therapy. Nevertheless, there were no significant differences between both groups in White Blood Cell (WBC), Red Blood Cell, platelets, and hemoglobin level at before and after I-131 therapy. Conclusions: The results of this study confirm that the administration of curcumin to the patients, in nano-micelle form, may prevent the genetic damage induced by I-131 in human lymphocyte. There was no significant difference between the two groups in terms of 4 parameters (White Blood Cell (WBC), Red Blood Cell (RBC), platelets, and hemoglobin level) at baseline and after 1 week (Table 1). Conflict of Interest: There is no actual or potential conflict of interest regarding this manuscript. 1. Shafaghati N, Hedayati M, Hosseinimehr SJ. Protective effects of curcumin against genotoxicity induced by 131-iodine in human cultured lymphocyte cells. Pharmacogn Mag. 2014;10(38):106-10. doi: 10.4103/0973-1296.131020. [PubMed: 24914274]. [PubMed Central: PMC4048555]. 2. Dardano A, Ballardin M, Caraccio N, Boni G, Traino C, Mariani G, et al. The effect of Ginkgo biloba extract on genotoxic damage in patients with differentiated thyroid carcinoma receiving thyroid remnant ablation with iodine-131. Thyroid. 2012;22(3):318-24. doi: 10.1089/thy.2010.0398. [PubMed: 22181338]. 3. Hosseinimehr SJ. Flavonoids and genomic instability induced by ionizing radiation. Drug Discov Today. 2010;15(21-22):907-18. doi: 10.1016/j.drudis.2010.09.005. [PubMed: 20933097]. 4. Bushnell DL, Boles MA, Kaufman GE, Wadas MA, Barnes WE. Complications, sequela and dosimetry of iodine-131 therapy for thyroid carcinoma. J Nucl Med. 1992;33(12):2214-21. [PubMed: 1460519]. 5. Van Nostrand D. The benefits and risks of I-131 therapy in patients with well-differentiated thyroid cancer. Thyroid. 2009;19(12):1381-91. doi: 10.1089/thy.2009.1611. [PubMed: 20001720]. 6. Jarzab B, Handkiewicz-Junak D, Wloch J. Juvenile differentiated thyroid carcinoma and the role of radioiodine in its treatment: a qualitative review. Endocr Relat Cancer. 2005;12(4):773-803. doi: 10.1677/erc.1.00880. [PubMed: 16322322]. 7. Tuttle RM, Becker DV, Hurley JR. Radioiodine treatment of thyroid disease. In: Sandler MP, Coleman RE, Patton JE, Wackers FJT, Gottschalk A, editors. Diagnostic nuclear medicine. 2003. 8. Fard-Esfahani A, Emami-Ardekani A, Fallahi B, Fard-Esfahani P, Beiki D, Hassanzadeh-Rad A, et al. Adverse effects of radioactive iodine-131 treatment for differentiated thyroid carcinoma. Nucl Med Commun. 2014;35(8):808-17. doi: 10.1097/MNM.0000000000000132. [PubMed: 24751702]. 9. Baugnet-Mahieu L, Lemaire M, Leonard ED, Leonard A, Gerber GB. Chromosome aberrations after treatment with radioactive iodine for thyroid cancer. Radiat Res. 1994;140(3):429-31. doi: 10.2307/3579122. [PubMed: 7972697]. 10. Watanabe N, Kanegane H, Kinuya S, Shuke N, Yokoyama K, Kato H, et al. The radiotoxicity of 131I therapy of thyroid cancer: assessment by micronucleus assay of B lymphocytes. J Nucl Med. 2004;45(4):608-11. [PubMed: 15073256]. 11. Little JB. Radiation carcinogenesis. Carcinogenesis. 2000;21(3):397-404. doi: 10.1093/carcin/21.3.397. [PubMed: 10688860]. 12. Noaparast Z, Hosseinimehr SJ. Radioprotective agents for the prevention of side effects induced by radioiodine-131 therapy. Future Oncol. 2013;9(8):1145-59. doi: 10.2217/fon.13.79. [PubMed: 23902246]. 13. Garg AK, Buchholz TA, Aggarwal BB. Chemosensitization and radiosensitization of tumors by plant polyphenols. Antioxid Redox Signal. 2005;7(11-12):1630-47. doi: 10.1089/ars.2005.7.1630. [PubMed: 16356126]. 14. Hejazi J, Rastmanesh R, Taleban FA, Molana SH, Ehtejab G. A pilot clinical trial of radioprotective effects of curcumin supplementation in patients with prostate cancer. J Cancer Sci Ther. 2013;5(10):320-4. doi: 10.4172/1948-5956.1000222. 15. Jagetia GC, Rajanikant GK. Effect of curcumin on radiation-impaired healing of excisional wounds in mice. J Wound Care. 2004;13(3):107-9. doi: 10.12968/jowc.2004.13.3.26589. [PubMed: 15045805]. 16. Jagetia GC, Rajanikant GK. Acceleration of wound repair by curcumin in the excision wound of mice exposed to different doses of fractionated gamma radiation. Int Wound J. 2012;9(1):76-92. doi: 10.1111/j.1742-481X.2011.00848.x. [PubMed: 21883936]. 17. Ozgen SC, Dokmeci D, Akpolat M, Karadag CH, Gunduz O, Erbas H, et al. The Protective Effect of Curcumin on Ionizing Radiation-induced Cataractogenesis in Rats. Balkan Med J. 2012;29(4):358-63. doi: 10.5152/balkanmedj.2012.038. [PubMed: 25207034]. [PubMed Central: PMC4115869]. 18. Flora G, Gupta D, Tiwari A. Preventive efficacy of bulk and nanocurcumin against lead-induced oxidative stress in mice. Biol Trace Elem Res. 2013;152(1):31-40. doi: 10.1007/s12011-012-9586-3. [PubMed: 23292317]. 19. Yadav A, Lomash V, Samim M, Flora SJ. Curcumin encapsulated in chitosan nanoparticles: a novel strategy for the treatment of arsenic toxicity. Chem Biol Interact. 2012;199(1):49-61. doi: 10.1016/j.cbi.2012.05.011. [PubMed: 22704994]. 20. Mateuca R, Lombaert N, Aka PV, Decordier I, Kirsch-Volders M. Chromosomal changes: induction, detection methods and applicability in human biomonitoring. Biochimie. 2006;88(11):1515-31. doi: 10.1016/j.biochi.2006.07.004. [PubMed: 16919864]. 21. Hosseinimehr SJ, Shafaghati N, Hedayati M. Genotoxicity induced by iodine-131 in human cultured lymphocytes. Interdiscip Toxicol. 2013;6(2):74-6. doi: 10.2478/intox-2013-0013. [PubMed: 24179432]. [PubMed Central: PMC3798859]. 22. Gutierrez S, Carbonell E, Galofre P, Creus A, Marcos R. Cytogenetic damage after 131-iodine treatment for hyperthyroidism and thyroid cancer. A study using the micronucleus test. Eur J Nucl Med. 1999;26(12):1589-96. doi: 10.1007/s002590050499. [PubMed: 10638411]. 23. Ebrahimnejad P, Dinarvand R, Jafari MR, Tabasi SA, Atyabi F. Characterization, blood profile and biodistribution properties of surface modified PLGA nanoparticles of SN-38. Int J Pharm. 2011;406(1-2):122-7. doi: 10.1016/j.ijpharm.2010.12.022. [PubMed: 21185365]. 24. Fenech M. The in vitro micronucleus technique. Mutat Res. 2000;455(1-2):81-95. [PubMed: 11113469]. 25. American Thyroid Association Guidelines Taskforce on Thyroid N, Differentiated Thyroid C, Cooper DS, Doherty GM, Haugen BR, Kloos RT, et al. Revised American Thyroid Association management guidelines for patients with thyroid nodules and differentiated thyroid cancer. Thyroid. 2009;19(11):1167-214. doi: 10.1089/thy.2009.0110. [PubMed: 19860577]. 26. Monteiro Gil O, Oliveira NG, Rodrigues AS, Laires A, Ferreira TC, Limbert E, et al. Cytogenetic alterations and oxidative stress in thyroid cancer patients after iodine-131 therapy. Mutagenesis. 2000;15(1):69-75. doi: 10.1093/mutage/15.1.69. [PubMed: 10640533]. 27. Ballardin M, Gemignani F, Bodei L, Mariani G, Ferdeghini M, Rossi AM, et al. Formation of micronuclei and of clastogenic factor(s) in patients receiving therapeutic doses of iodine-131. Mutat Res. 2002;514(1-2):77-85. doi: 10.1016/S1383-5718(01)00323-0. [PubMed: 11815246]. 28. Nofal MM, Beierwaltes WH. Persistent Chromosomal Aberrations Following Radioiodine Therapy. J Nucl Med. 1964;5:840-50. [PubMed: 14247780]. 29. Dhillon N, Aggarwal BB, Newman RA, Wolff RA, Kunnumakkara AB, Abbruzzese JL, et al. Phase II trial of curcumin in patients with advanced pancreatic cancer. Clin Cancer Res. 2008;14(14):4491-9. doi: 10.1158/1078-0432.CCR-08-0024. [PubMed: 18628464]. 30. Kanai M, Yoshimura K, Asada M, Imaizumi A, Suzuki C, Matsumoto S, et al. A phase I/II study of gemcitabine-based chemotherapy plus curcumin for patients with gemcitabine-resistant pancreatic cancer. Cancer Chemother Pharmacol. 2011;68(1):157-64. doi: 10.1007/s00280-010-1470-2. [PubMed: 20859741]. 31. Tsai YM, Chien CF, Lin LC, Tsai TH. Curcumin and its nano-formulation: the kinetics of tissue distribution and blood-brain barrier penetration. Int J Pharm. 2011;416(1):331-8. doi: 10.1016/j.ijpharm.2011.06.030. [PubMed: 21729743]. 32. Zhongfa L, Chiu M, Wang J, Chen W, Yen W, Fan-Havard P, et al. Enhancement of curcumin oral absorption and pharmacokinetics of curcuminoids and curcumin metabolites in mice. Cancer Chemother Pharmacol. 2012;69(3):679-89. doi: 10.1007/s00280-011-1749-y. [PubMed: 21968952]. [PubMed Central: PMC3368221]. 33. Wahlang B, Kabra D, Pawar YB, Tikoo K, Bansal AK. Contribution of formulation and excipients towards enhanced permeation of curcumin. Arzneimittelforschung. 2012;62(2):88-93. doi: 10.1055/s-0031-1295487. [PubMed: 22344553]. 34. Silberstein EB, Alavi A, Balon HR, Clarke SE, Divgi C, Gelfand MJ, et al. The SNMMI practice guideline for therapy of thyroid disease with 131I 3.0. J Nucl Med. 2012;53(10):1633-51. doi: 10.2967/jnumed.112.105148. [PubMed: 22787108]. 35. Dardano A, Ballardin M, Ferdeghini M, Lazzeri E, Traino C, Caraccio N, et al. Anticlastogenic effect of Ginkgo biloba extract in Graves' disease patients receiving radioiodine therapy. J Clin Endocrinol Metab. 2007;92(11):4286-9. doi: 10.1210/jc.2007-0597. [PubMed: 17711926].